This article is a work in progress, if you have additional info please say so! It shows the basic info on the engine, but a preliminary amount of bhp and torque. 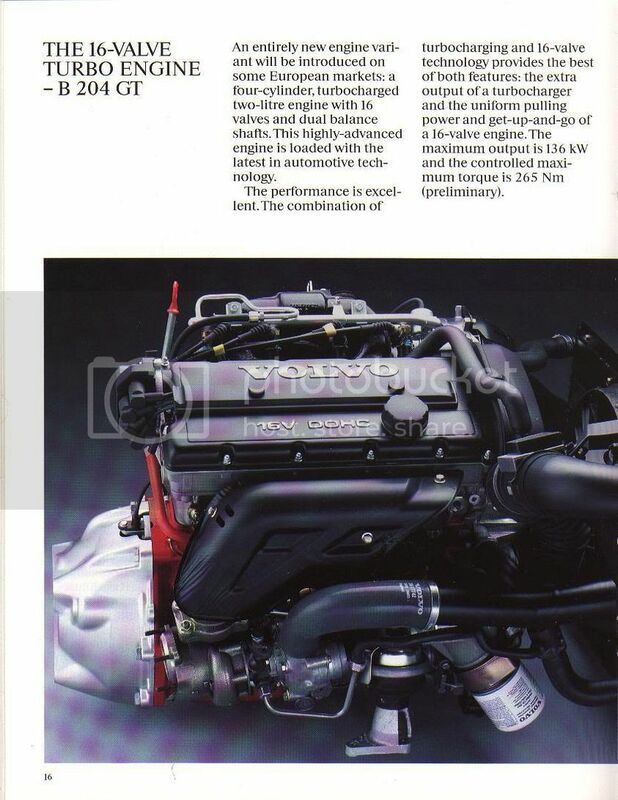 Engines B204 FT/GT are two four cylinder 16-valve turbocharged engines of 2.0 liters cylinder capacity. There is no difference in appearance between the two engines. The difference between the FT and GT engines is that the GT does not have a three-way catalytic converter and has a lead resistant heated oxygen sensor (HO2S) so that it can be run on regular gasoline. 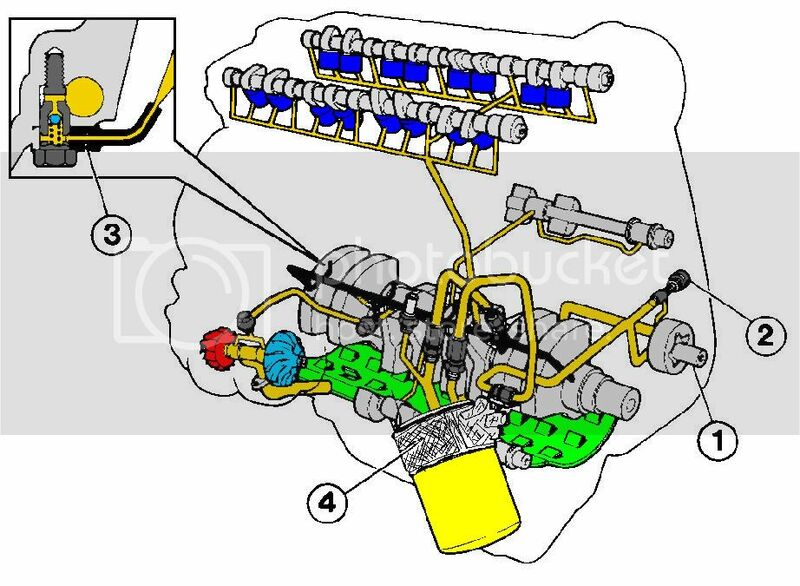 The cylinder head is built in the same way as Volvos other 16 valve engines the exception being certain differences in the camshafts and valves. The camshafts have modified cam profiles with lower lift height and faster opening/closing. The valvesprings are slightly stiffer in order to follow the cam profiles. The new cam shaft profiles give a high low rev torque combined with free revving. The valves have the same dimensions as the B 204 E, but the exhaust valves are sodium filled for better cooling. 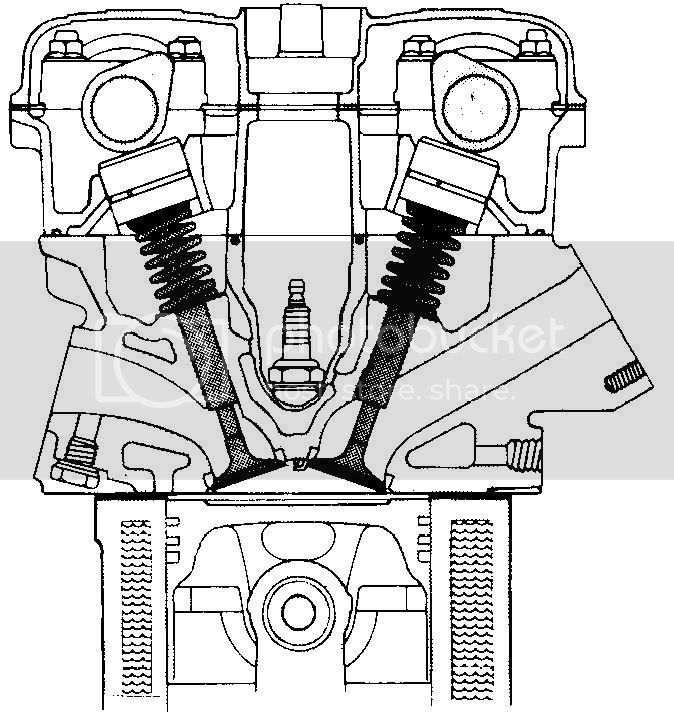 The valves are operated by twin overhead camshafts through hydraulic tappets. 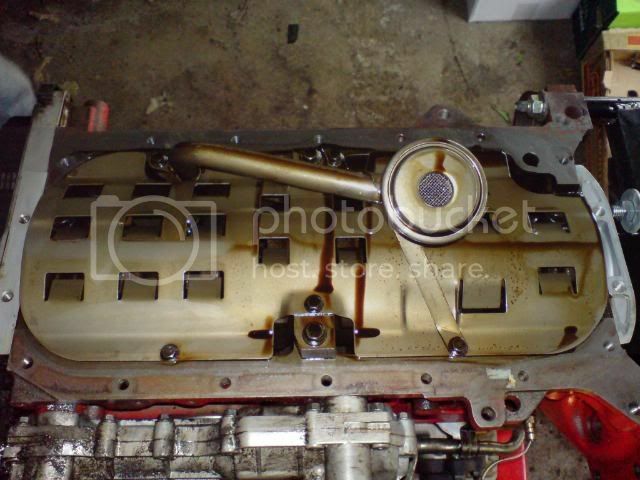 The oil-filled tappets are self-adjusting. The valve guides are inclined at an angle of 19° to the vertical. 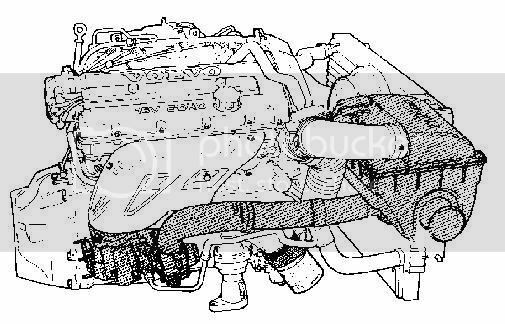 The B204GT and B204FT are fitted with the FI (inlet) and FA (exhaust) camshafts. 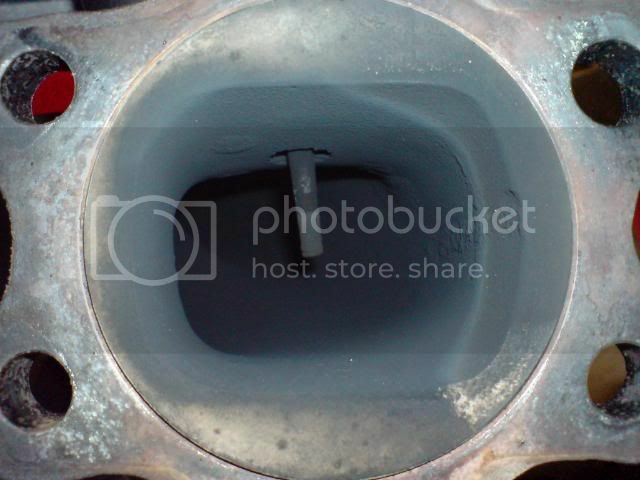 The 'pent-roof' combustion chamber features squish zones which force the fuel/air mixture towards the centre of the chamber as the piston approaches top dead centre (TDC) on the compression stroke - a feature which promotes excellent mixing as the fuel approaches the spark plug. 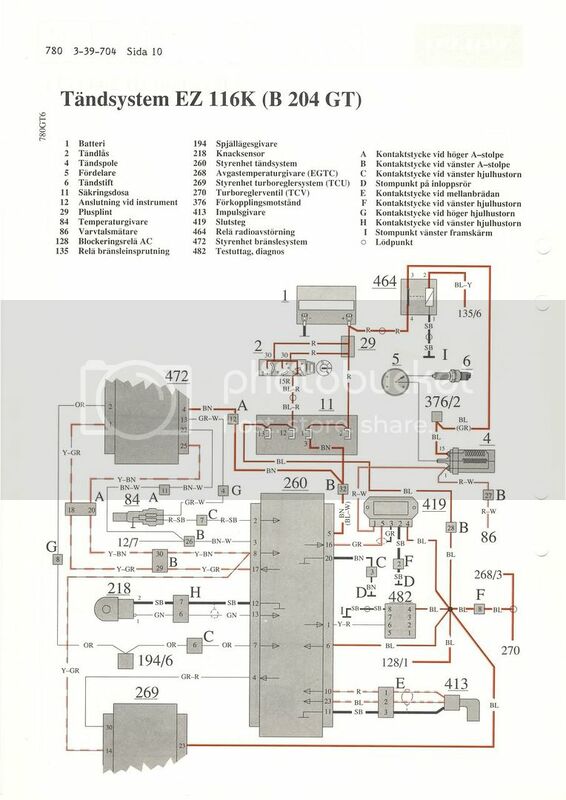 The resultant short combustion path promotes rapid combustion, reducing the risk of self-ignition (or knock) and enabling a high compression ratio to be used. This, in turn, yields high performance at low fuel consumption. The exhaust manifold together with the turbo gives the advantage that a larger amount of the exhaust motion and heat energies can be used to drive the turbine and the compressor. The exhaust manifold is designed to give maximum emission speed and equal exhaust back pressure in all cylinders which means that the exhaust energy can be used in a more effective way. The turbocharger (TC) has a integral by-pass valve which damps the pressure rises which occur as a result of the throttle shutting quickly, which can otherwise disturb the mass air flow (MAF) sensor and cause problems with driveability. 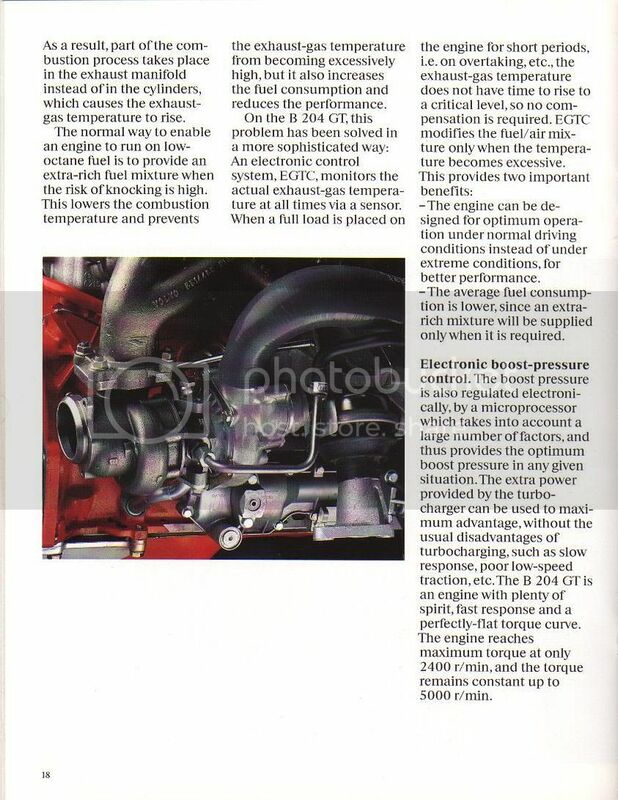 The more air that is carried to the engine the more fuel that be burned and thus the engine gives better performance. 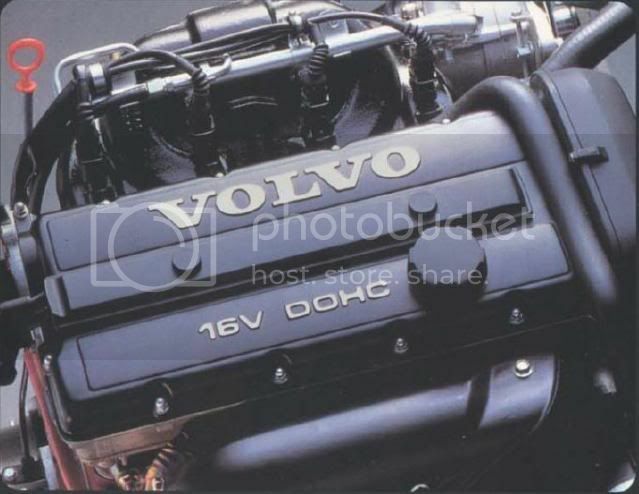 To satisfy the high turbo engine specifications, due to the high load and temperature, the following changes have been made compared to the other 16 valve engines. 1.The oil pump capacity has been increased by 20% by a wider pump wheel and a modified profile. 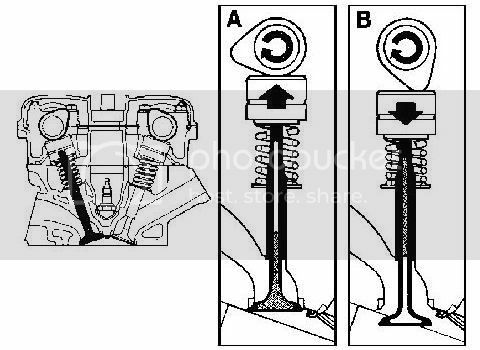 2.The relief valve has a stiffer spring and opens at 5 bar pressure. 3.The engine is equipped with piston cooling openings to cool the pistons. 4.The oil cooler ensures that the oil does become overheated with high loading. The B204FT/GT engine is equipped with an electronically controlled turbocharger (TC) control system to give optimum boost pressure and thus engine power under all varying circumstances. By varying the boost pressure electronically, the turbocharger (TC) gives full power from 2300 (I think this is incorrect, more like 3500) rpm which in turn gives high torque through the whole engine speed range. To provide maximum power with good bottom end torque, fast response and low fuel consumption, the B 204FT engine is equipped with a control system which is regulated by a TCU (Turbo Control Unit). The control module controls the turbocharger (TC) boost pressure, electric cooling fans and climate control AC compressor. -1. Boost pressure control (BPC) valve. -2. Throttle position (TP) sensor. -4. Turbocharger (TC) control valve. -5. Manifold absolute pressure (MAP) sensor. -Current turbocharger (TC) boost pressure from a manifold absolute pressure (MAP) sensor mounted in the control module. -Engine speed (RPM) signal from fuel injection system control module. 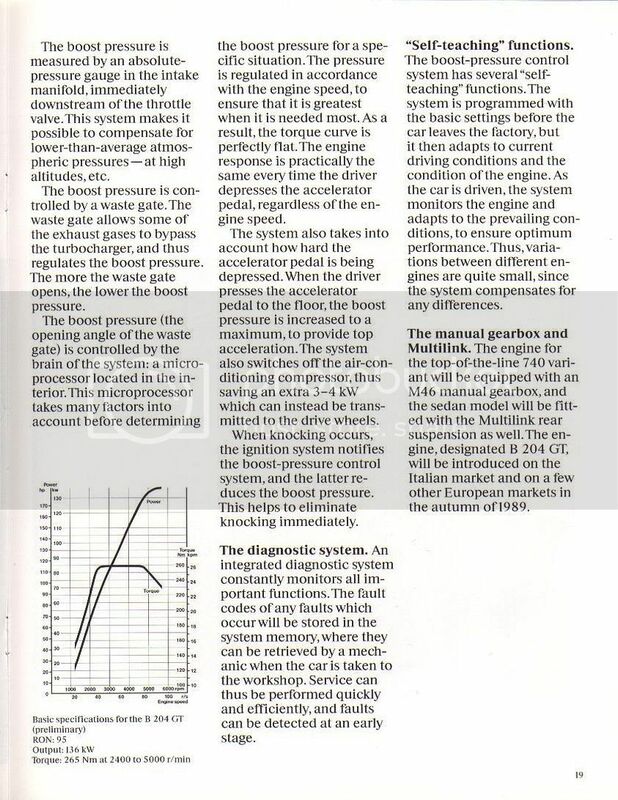 -Information on the engine coolant temperature (ECT) from the temperature sensor mounted in the radiator. 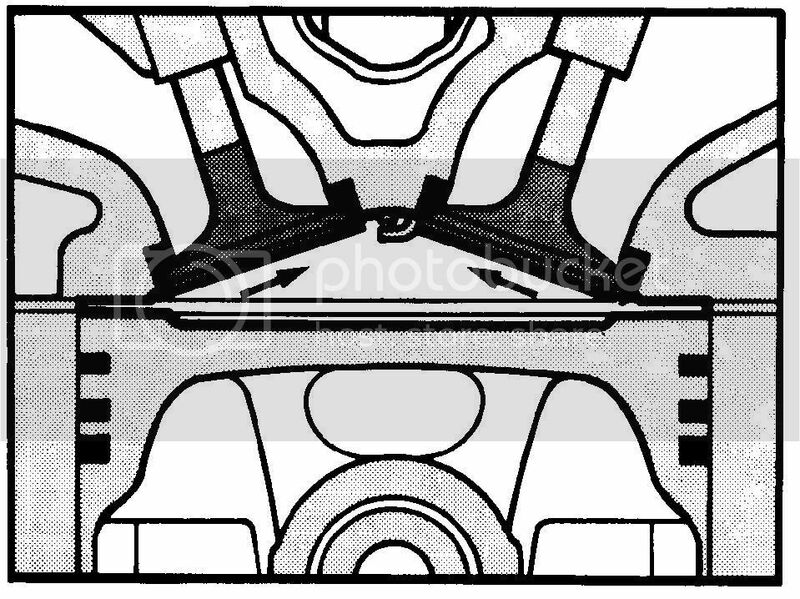 -Throttle opening angle from throttle position (TP) sensor. -Knock signal from the ignition system control module. -Signal from air conditioning (A/C) system pressure switches. 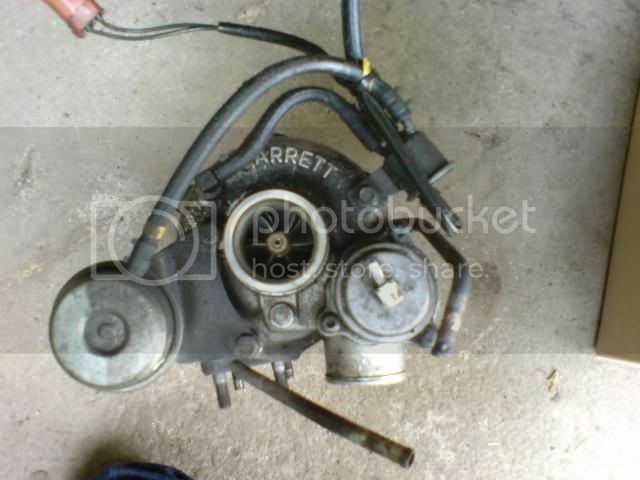 -Grounds the turbocharger (TC) control valve to control boost pressure. -Lowers the boost pressure after maximum ignition retardation at ignition knock. 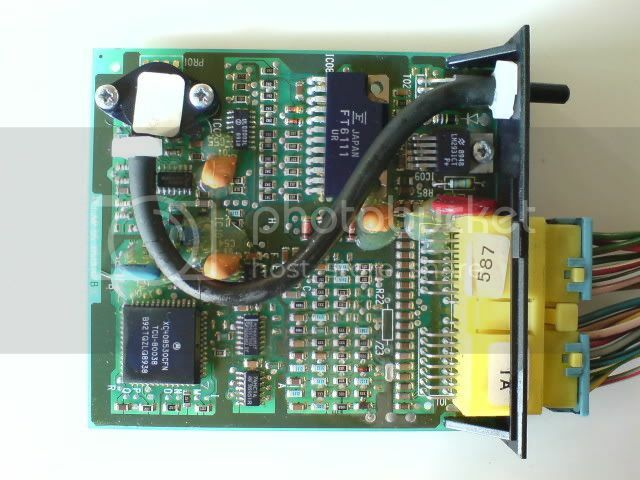 -Controls engine cooling fan (FC). -Sends a signal to the LH-control module about idle air trim when the engine cooling fan (FC) runs at high-speed when the engine is idling. -Disconnects the air conditioning (A/C) compressor when there is a high load on the engine. 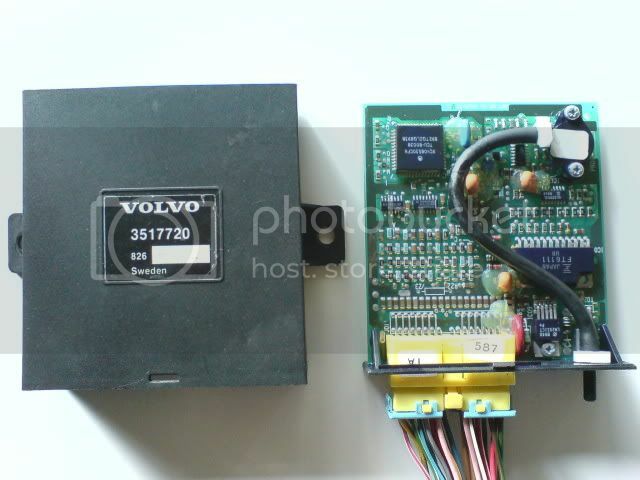 -Is connected to the onboard diagnostic system and sends a signal if a fault occurs in the functions. -Goes into an emergency program if certain signals are faulty or missing. The signals are given a programmed value so that the car can be driven to the workshop at a low speed. 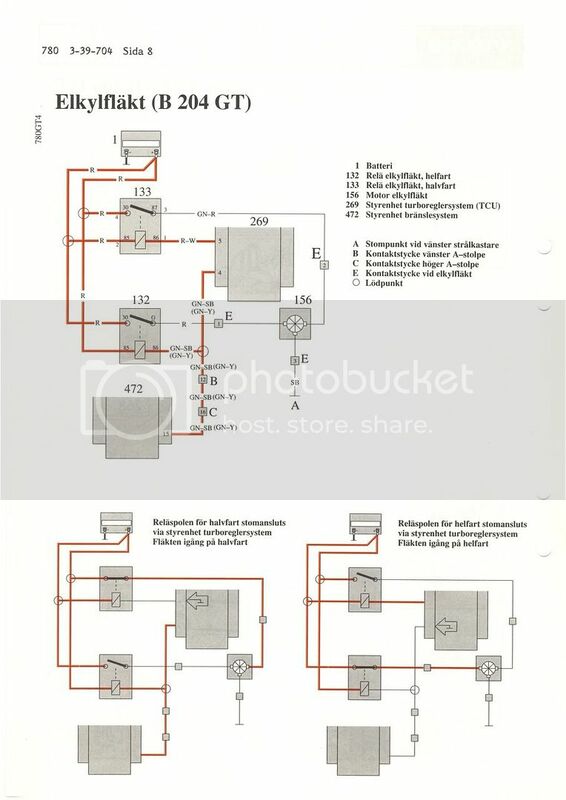 If ignition knock should occur the ignition is retarded individually for each cylinder until the knocking stops. 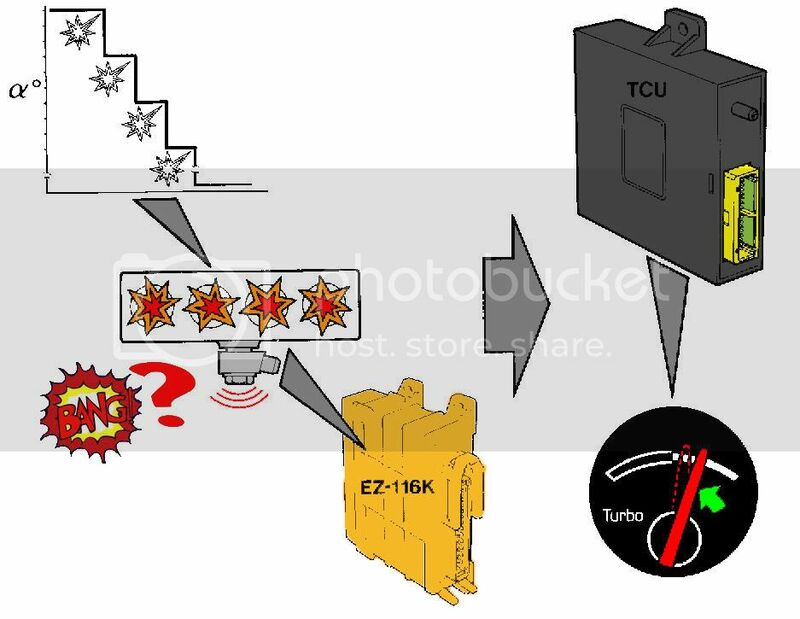 If the engine continues to knock despite the ignition being maximally retarded on each cylinder, the ignition system control module sends a signal to the turbocharger (TC) control module which then lowers boost pressure in stages. The value of the boost pressure being lowered depends on when the knock occurs. 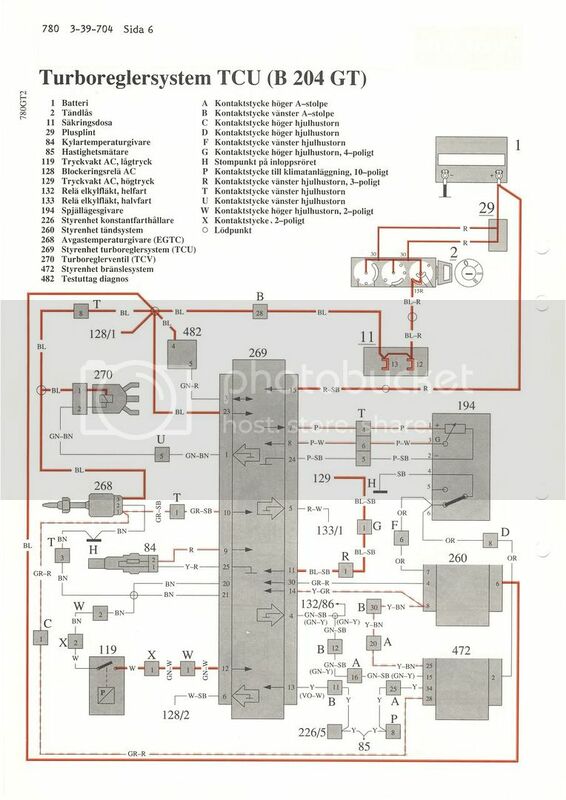 This still gives lower fuel consumption than the previous system, when the fuel enrichment was corrected when the ignition was retarded maximally. The turbocharger (TC) control valve is a three way solenoid valve which is used to control the turbocharger (TC) boost pressure exactly and so eliminate “turbo lag”. When the solenoid valve is not operating the terminal to the turbocharger (TC) intake side is closed while the terminals between the turbocharger (TC) pressure side and pressure regulator are open. Only the turbocharger (TC) boost pressure affects the pressure regulator which then functions as a normal mechanical system for boost pressure control, which gives a relatively low boost pressure, maximum 40 kPa. 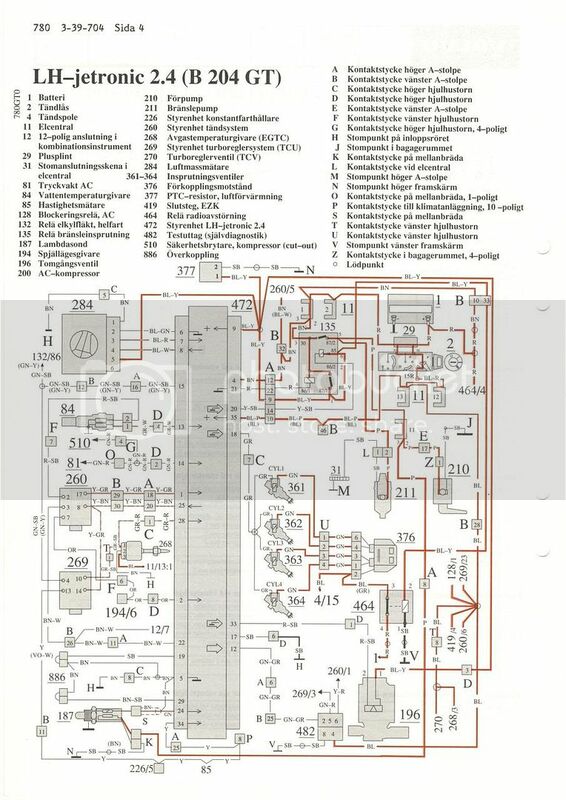 The turbocharger (TC) control system control module receives the signal from the throttle position (TP) sensor, engine speed (RPM) signal from LH 2.4–control module and determines a desired value for the turbocharger (TC) boost pressure. This desired value is changed to a control signal to the turbocharger (TC) control valve which opens. The terminals to the turbocharger (TC) intake side are connected to the turbocharger (TC) pressure side and pressure regulator for a limited time, which gives a reference pressure to the pressure regulator. The control signal gives a fast pulsing square wave signal with a frequency of 32 Hz. The solenoid valve opens and shuts once per period. This gives a mixture of atmospheric pressure and boost pressure in the pressure regulator, which because of its sluggishness will assume a position which is proportional to the solenoid valve opening and closing times. The control pressure depends on the relationship between the time that the valve is open or closed during a period. Because the control pressure is a mixture of turbocharger (TC) boost pressure and atmospheric pressure the boost pressure can increase to a value that exceeds the value that the pressure regulator would usually regulate. Maximum turbocharger (TC) boost pressure is 80 kPa above atmospheric pressure. 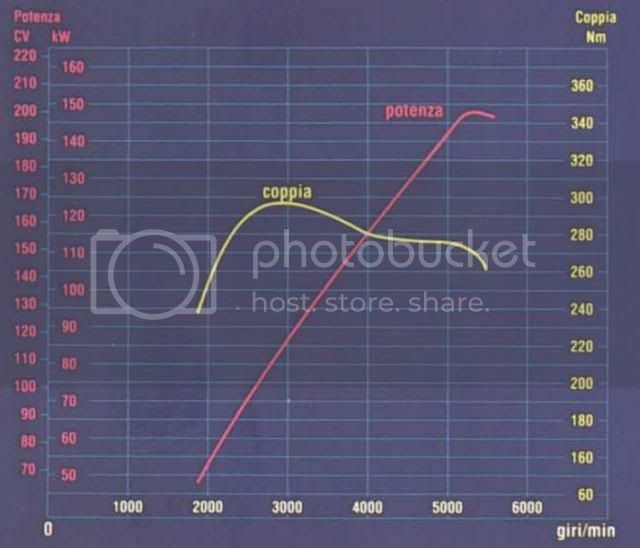 A high boost pressure is retained even at fast throttle opening despite low engine speed (RPM), which gives fast response and eliminates “turbo lag”. To avoid excessively high exhaust gas temperatures and reduce fuel consumption a special temperature sensor called an EGTC (Exhaust Gas Temperature Controller) is used. 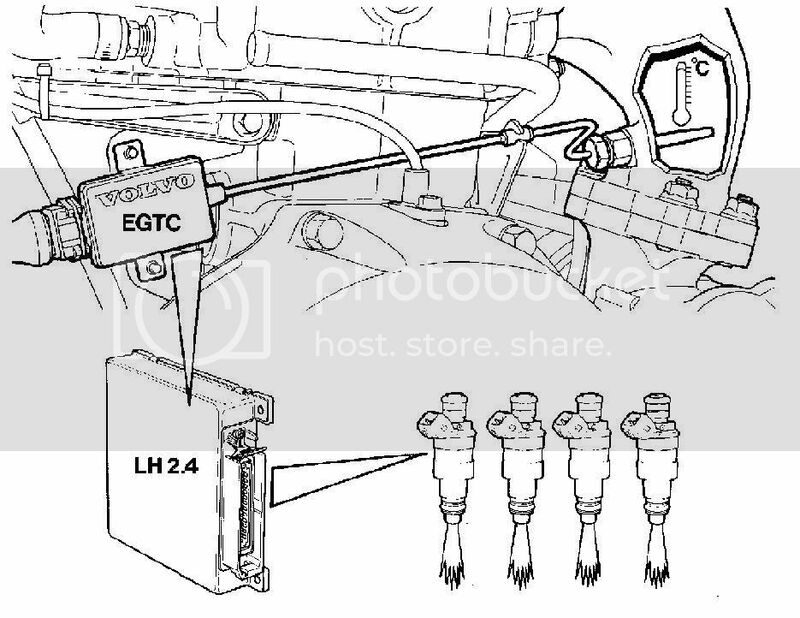 The EGTC sensor consists of a thermo element mounted in the exhaust manifold in front of the turbocharger (TC). It senses the exhaust temperature and generates a signal which is amplified in an electronic circuit mounted on the reverse of the engine. The amplified temperature signal is sent further to the fuel injection system control module, which gradually extends the injection period exhaust when the temperature reaches a critical level (approximately 950°C). 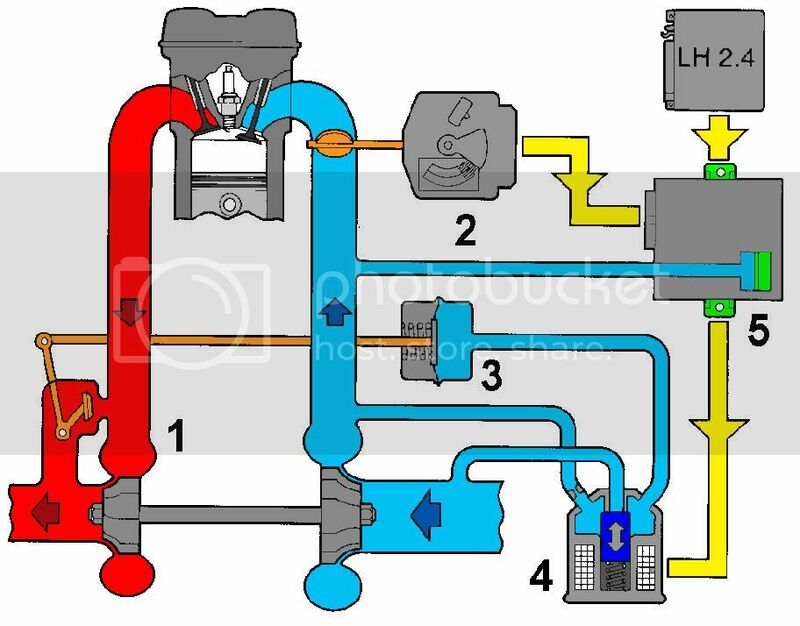 This contributes to a lower combustion temperature which in turn reduces the exhaust gas temperature, after which the increased fuel supply stops when the exhaust gas temperature has reached a normal level. 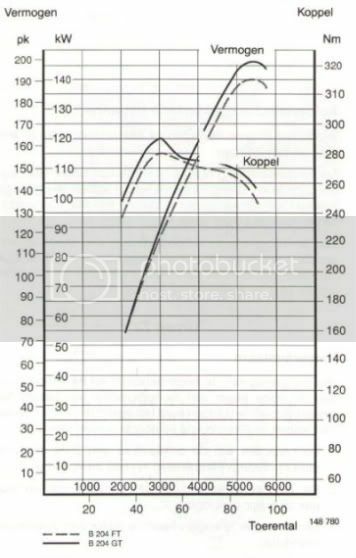 High exhaust gas temperatures occur for example at high power takeup over a long period of time, when driving in a hot climate or when driving with low octane fuel. The B204FT/GT engine has forged pistons, combined with the normal connection rods (13mm). The pistons have valve reliefs cut in to them. Last edited by Turbosteen; 11-08-2010 at 05:39 AM.. Thanks for the excellent press pack. 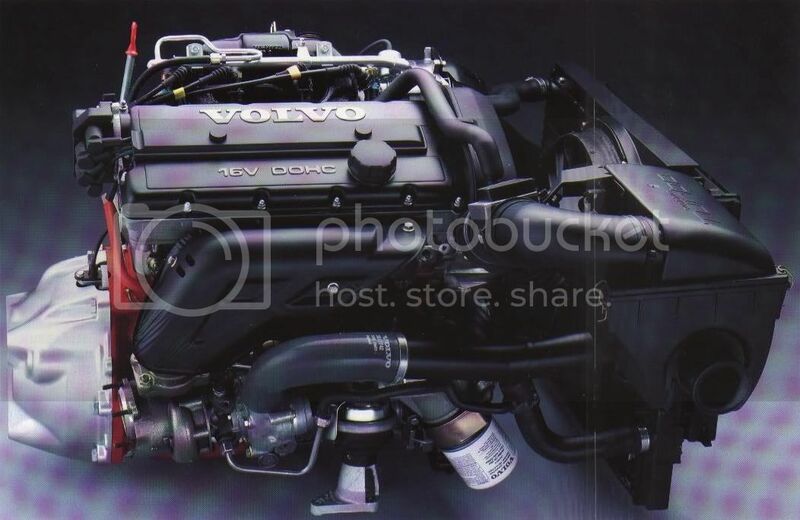 I've only learned of this engine very recently and it appears volvo did give the 4g63 a run for its money back in the late 80s. Probably the only and most complete description of these almost mythic engines. Very nice. I wonder if there exist a green book for these factory beasts? Location: England, that little island that everyone fled except me. Yes I have the said green book in my archives. 1 RIP, 1 750R and 1 Sold Many moons ago!!!! 05 Jeep Grand Cherokee for DD Duties these days. I really want to have one. Send me a pm if you selling it. Does it on paper or in electronic form? If on paper tell me how much you want for it. I suppose if scanned may be you just share it? Its a paper version i have and i'm afraid i don't want to sell it at the moment, as its in my libary of near enough every green book volvo made. I cleared out a dealers 30 year collection a couple of years back. One day somehow i'd like to make them all as PDF's so that i can share the info, but for the moment my first priority is to get more room to actually have them on bookshelves so there easily accessible, not in boxes in storage. http://forums.turbobricks.com/showthread.php?t=90919 as you can see from the post, they were only allowed in the kitchen for a little while before being packed away. Wow! I never, ever seen such a collection! Very nice. It is quite time consuming task to get all the books to PDF's - even one. More over it is a matter of tweaking and trying the settings of the scanner software to make the PDF's to be good quality and small (enough) size at the same time. How can I contribute? I am ready to pay you some price to get the scans of B204 FT/GT manuals soon. Because "One day somehow.." may never come, you know. Next time i go down to storage I will bring back that green book and look at spending a very boring afternoon scanning. Sometimes i wonder if it would be quicker to use a very good camera and take pictures. Just keep sending me a Pm every month or so to keep reminding me as i may forget what with the hundreds of things i've got to sort out at the moment. It would not be much quicker with the camera. And you have to setup some very good and even light, and some kind of tripod or something to get the camera perpendicular to the pages. Is there some shops that offer this kind of service? I am ready to pay for the quality scan. Last edited by ipdown; 10-23-2009 at 01:24 PM..
Just wondering if you (Turbosteen) checked at the dealer about availability and pricing for the green book manual? B204FT/GT and B204E heads? I know the valves, springs and cams are different, but what about combustion chambers? Where higher C/R comes from? Pistons? I found an B204E N/A engine in a good condition and plan to buy it for parts, mostly the head. B204FT/GT 1001094 iirc, I think its the same number for the B204E stuff. Also, I expected to have sodium filled exhaust valves P/N 3514491, but I got P/N 1317792 on my engine, which seems to be AQ171 valves. Whats going wrong? I am totally confused. 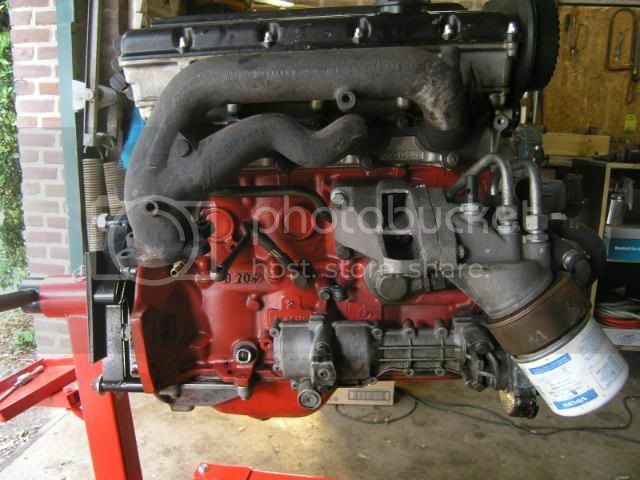 Should I buy this B204E head? If the combustion chambers are smaller what are my options? Greenbooks no longer available through Dutch dealership. By the way, took B204FT apart. Found no forged internals. 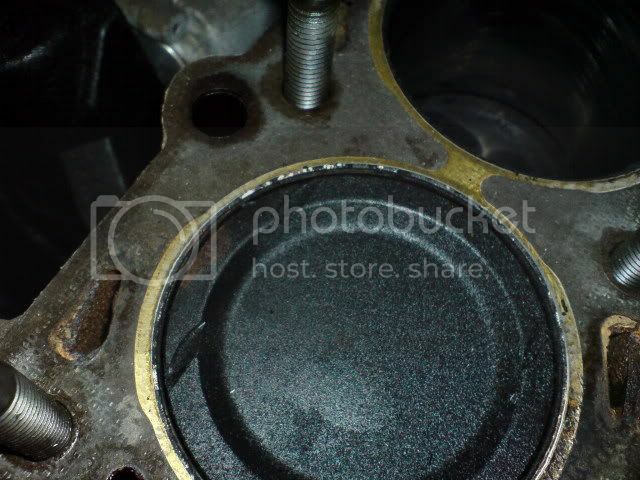 Pistons are cast Mahle. According to VADIS, pistons are cast light-alloy, forged are conrods and crankshaft. Maybe on paper but not to my findings. Crankshaft and rods aren't forged, sorry. BTW, got the B204E engine, the guy misled me, I don't know what number he was dictating me on the phone, but the cast number is the right one - 1001094. Still don't understand why my head have B234 number on it. Now I am driving across Bulgaria with the engine in the 740 turbodiesel boot - going to home. I can't imagine that Volvo didn't use the normal drop-forging for their conrods. heck, for years they made conrods and other critical engine components for a lot of other (industrial) companies as well. Powder-forming/forging wasn't that common 25 years ago. cast conrods anyone? 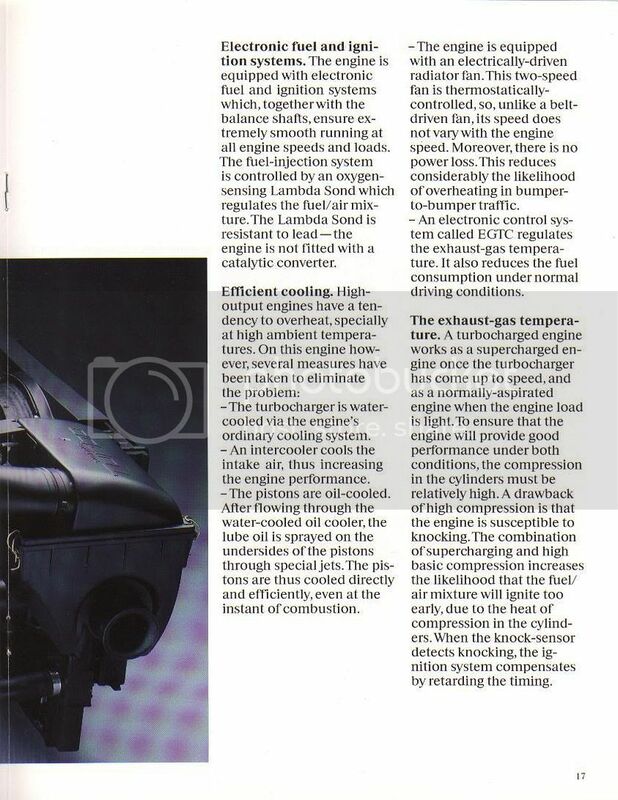 I've added the scans of the press article, can anyone tell me exactly in which countries these engines were available? I know a few (already in article), anyone else knows more? Very nice scans. Unfortunately I can't help you here. try to provide dump of the code inside - if it have Motorola debug routines inside, which I think it is. The microcontroller is mask-programmed, so it is not possible to reprogram it, but I think it would be quite easy to dissasemble it's code since it is small enough - ~5K of code. Knowing how the code internally works will help to abuse the unit, so that the boost pressure will be raised "legally". Last edited by sbabbs; 01-19-2010 at 10:05 AM..